UOPD is paying $755,000 to an officer and former student. Why? Last month, a jury awarded James Cleavenger $755,000 in damages in a lawsuit he brought against the University of Oregon Police Department. The jury found that the UOPD retaliated against Cleavenger for whistleblowing, wrongfully terminating him and attempting to destroy any further carrier opportunities he could have in law enforcement. James Cleavenger, a University of Oregon Police Department officer, reported for work on Sept. 20, 2012, like it was any other day — except it was his birthday. Cleavenger had been demoted several times over the past months, and his employment at the UOPD was on rocky ground since he was first hired a year earlier. When he arrived at work, Cleavenger was placed on paid administrative leave, pending an internal investigation against him and escorted off campus. Last month, a jury awarded Cleavenger $755,000 in damages in a lawsuit he brought against the UOPD in 2013. The jury found that the UOPD retaliated against Cleavenger for whistleblowing, wrongfully terminating him and attempting to destroy his future career opportunities in law enforcement. Cleavenger was hired onto the force in 2010 and promoted to full-time UOPD officer in March 2011. Used as a way for officers to vent about frustrations on the job, “The List” contains people, events and things that officers on the graveyard shift thought should “eat a bowl of dicks,” evolving from jokes around the office. At the time it was submitted for trial, the list had over 200 entries. The list contained primarily celebrities, with entries ranging from “Mick Jagger’s Arm Fat” to “Spongebob Squarepants,” but its contents worried Cleavenger when they edged into university politics. Campus bicyclists, Crowd Management Services (the security team at UO football games) and former ASUO president Amelie Rousseau all appear on the list. For example, Rousseau was added to the list because she was “adamantly against the police transition” from DPS to UOPD, LeRoy said in court. Cleavenger did not complain about any misconduct he witnessed, including the list, because he was still on his trial period and feared he would be fired. Lieutenant Brandon Lebrecht, a contributor to the list, was his superior officer. In October 2011, Sergeant Scott Cameron became Cleavenger’s direct supervisor. According to Cleavenger, Cameron started sharing information about Cleavenger’s past with Lebrecht (like his opposition to arming campus security with tasers in 2008) and then using it to harass him. In court, attorneys for the UOPD denied this claim. One month after Cleavenger received a new supervisor, he received a “Clarification of Expectations Letter” — his first reprimand. The letter said that Cleavenger had violated the department’s grooming standards by not shaving every day “on at least two occasions” and for officer safety concerns. “I’m the only person who’s ever been written up for [not] shaving,” Cleavenger said. “They wanted to punish more, write more tickets, make more arrests, so they could make a bigger push to become a police department,” Cleavenger said. In the defense’s opening statement, attorneys for UO said “[Cleavenger] approaches a contact believing, ‘You’re a good guy until you prove to me you’re not.’ And no matter how many times he’s talked to about this, he defends this position … He fails to appreciate the danger that he encounters on a daily basis,” they said. Cleavenger received another letter of reprimand in May 2012 accusing him of not complying with department standards in officer and safety tactics. It referenced an incident at Spencer View Apartments, prompting an internal investigation against Cleavenger. Cleavenger appealed the letter. Arbitration on the letter continued for a year until Cleavenger won. During arbitration, he was put on paid leave, then unpaid leave, before ultimately being fired. The arbitrator told the UOPD to reinstate Cleavenger and reimburse him for back pay. On May 17, 2014, UOPD submitted over 200 pages of documents attempting to place Cleavenger on the Brady List, a process in which a department places a former officer on a list naming them “untrustworthy,” which prevents them from testifying in court. Cleavenger’s attorney, Jason Kafoury, said placing Cleavenger on the Brady List would essentially ruin any potential career he may have in law enforcement, since it is very important for officers to testify in court. “Honest police officers should not have their careers ruined by command staff that’s retaliating against them for exercising their free speech,” Kafoury said. Cleavenger’s appearance on the Brady List is currently in question. Cleavenger filed the official lawsuit against UO, the UOPD and several UOPD employees on Oct. 13, 2013. Over the next year, defendants were narrowed down to Chief McDermed, Lieutenant Lebrecht and Sergeant Cameron. The verdict was given on Sept. 25. The jury found that McDermed, Lebrecht and Cameron took “adverse employment action against the plaintiff,” according to court documents. The jury felt that UOPD officers did not afford Cleavenger his First Amendment rights, and that they retaliated against him for filing the lawsuit in 2013. The amount awarded by the jury, $755,000, includes $650,000 in economic damages for ruining his potential career in law enforcement. Cleavenger’s taser comments in 2008 and the “Bowl of Dicks List” were not included as factors in their decision. 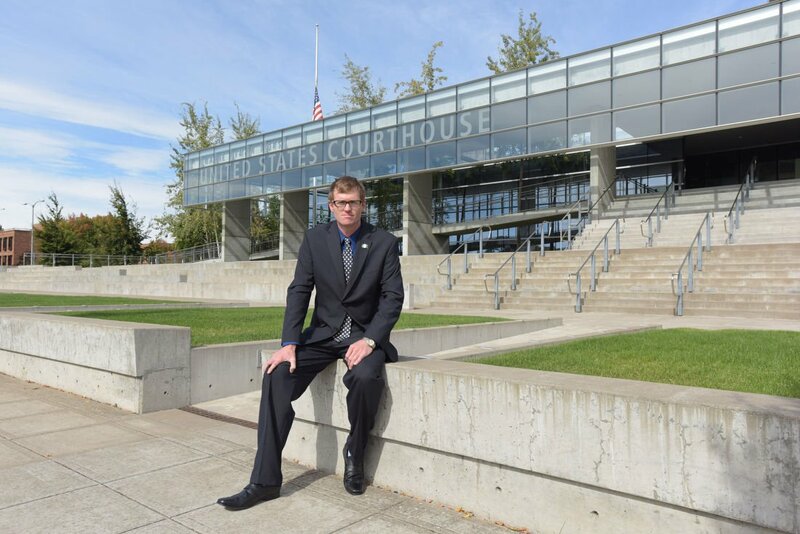 Cleavenger now works at the Eugene Federal Courthouse, and is also employed at the Coburg Police Department as a reserve police officer, working a combination of paid and volunteer positions. He hopes that community policing can still be a reality at UO. The UOPD declined to comment on this story.